After a fall, seniors may be feeling shame, frustration, and fear of their family’s reaction. We encourage you to have an honest and compassionate conversation about what happened, and to reassure them that their safety and health is your primary concern. By establishing open communication and trust in regards to their health, they may be more open to receiving help from you, doctors, and/or care professionals. Stay Calm and Show Your Support. It can be stressful, worrisome, and scary when a loved one falls, but it is important to stay calm and strong for your loved one. If the daily care is causing you physical or emotional strain, know that you don’t have to do this alone. BrightStar Care’s specially trained nurses and caregivers are available to support you and your loved one. The most important thing you can provide your loved one during the recovery process is your love and support. Encourage Follow-Up Appointments with the Doctor. If the fall resulted in a trip to the hospital or a rehabilitation facility, set the follow-up doctor appointments in advance. It’s important to have the doctor check up on your loved one’s recovery status and examine his or her overall health and vision. Even if you and your loved one are positive that the fall was caused by tripping on a rug, a well-rounded evaluation could uncover potential issues that made that fall more likely. 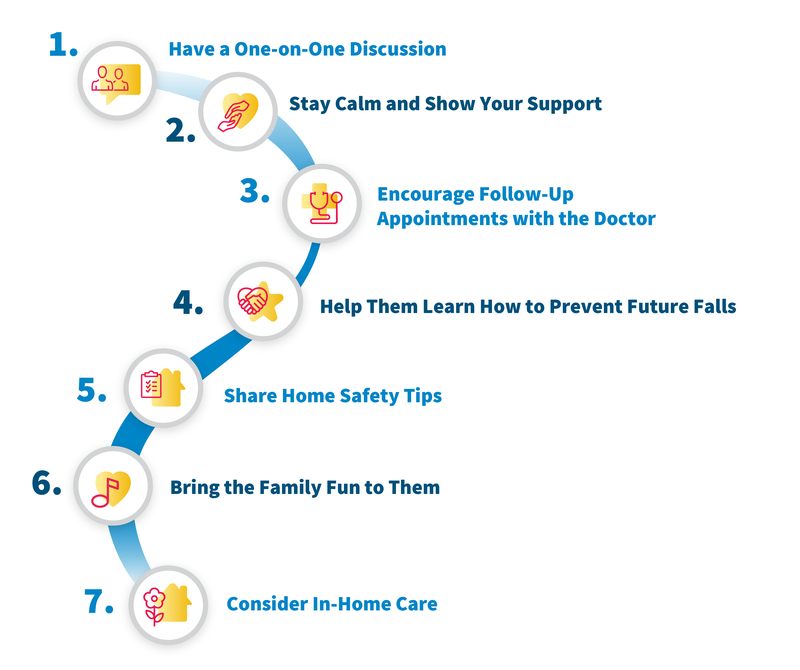 If your loved one is convinced he or she is okay and doesn’t need to go, remind them that this is an important step in staying safe and preventing future falls. Help Them Learn How to Prevent Future Falls. Seniors who are recovering from a fall or injury are at a higher risk of future falls, sometimes due to reduced activity from a fear of falling again. Because of this, it’s important to be proactive about building your loved one’s strength and confidence in walking around the house. When well enough to do so, encourage your loved one to get up for some light exercise and activity to improve balance and stability. They may be timid at first, but the long-term results will ensure his or her mobility and safety. In addition to learning more about fall prevention, there are many senior home safety tips your loved one may benefit from in the long run. As he or she recovers and regains mobility, take the time to identify and discuss the potential risks and hazards around the home, and how you can work together to figure out how to make his or her home the safest, most comfortable place possible. Additionally, a BrightStar Care Registered Nurse Director of Nursing can conduct a home safety check as part of creating a customized care plan for your loved one. Bring the Family Fun to Them. Depending on your loved one’s recovery status and mobility after the fall, he or she may feel isolated or cooped up at home. Brighten his or her spirits by scheduling times during the week for family fun. Put together a pre-dinner board game competition, or set up a family movie night with popcorn and your loved one’s favorite treats. If you don’t live nearby, have your kids sing their favorite song over the phone, or even film and send the musical act entirely. Your loved one will be sure to love the change of pace, and a boost in mood may encourage them through recovery. BrightStar Care can provide in-home support, from short-term transitional care to more long-term assistance, to help your loved one recover safely and regain independence after a fall. Some seniors may need just a little help with chores and groceries, while others may need more advanced help with showering or medication management. Whatever the case, starting the conversation about in-home care can be a positive step in helping your loved one recover in his or her own home while allowing you respite.